A detailed comparison of leading MRPs for SMEs. Whether you are outgrowing entry-level software or replacing a legacy system, choosing an ERP that is a good fit for your company can have a strong impact on your future growth and pro tability. Because the cost of implementing an ERP is so high, demanding a great deal of time and input from employees across your organization as well as potentially significant software licensing and consulting fees, there is tremendous pressure to get it right the first time. Despite these high stakes, most decision makers selecting and implementing ERP software will not do so more than a few times in their career. The purchasing relationship is therefore tilted in favor of the vendor, with many vendors requiring hours of qualification before revealing crucial details such as features and pricing. When dealing with vendors, it is therefore essential to accurately and completely communicate the needs of your organization to avoid finding out 6 months into implementation that the project isn’t feasible or that an unexpected and expensive custom development is required. In recent years there has been a trend in business software towards a software as a service (SaaS) model. Most major business software vendors, ERP or otherwise, have begun offering their locally installed products in a cloud-hosted version to provide additional flexibility. When deploying a cloud-based software, there is no need for a local server or other network hardware as data is managed and processed on a secure off-site server which, depending on the size of the deployment, can significantly reduce the initial cost of a system. This can make a cloud solution a better choice for small and medium size businesses with less capital. 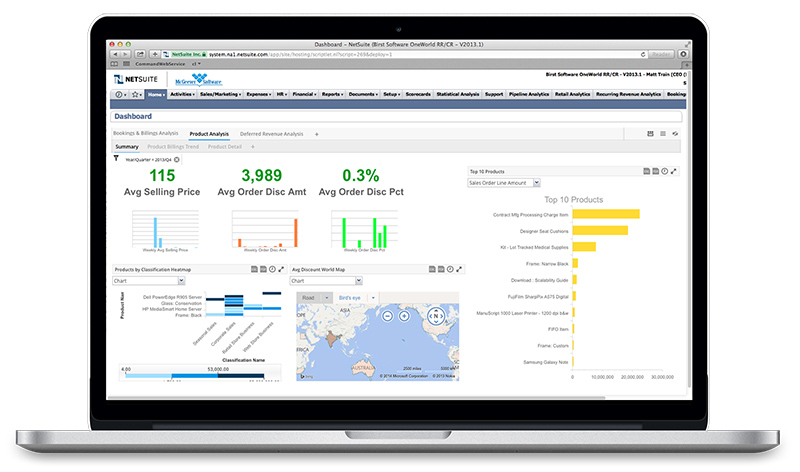 NetSuite was founded in 1998 as NetLedger, a cloud-hosted accounting software. It has since grown into a full-spectrum suite of business software applications. True to its name, NetSuite is available exclusively through the cloud. NetSuite employs a modular structure, with each deployment comprised of a selection of its core modules or “apps”. 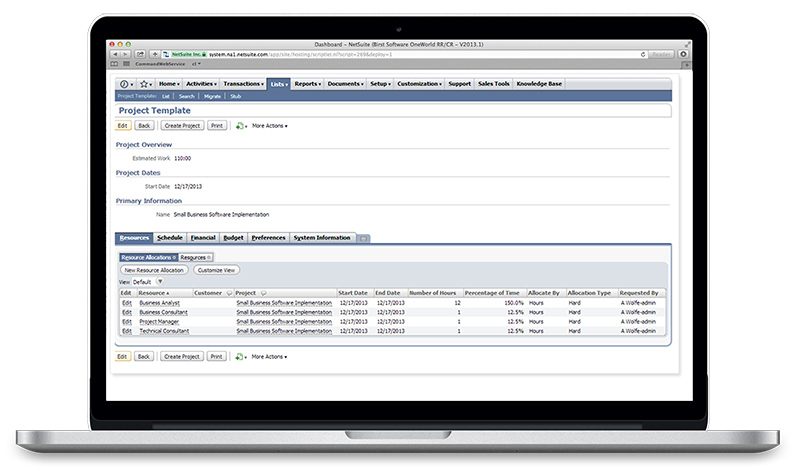 NetSuite offers preconfigured “suites” of apps to match the needs of different market segments. Apps are also sold a la carte, ranging in price from $199 to $499 each. Some modules exist as basic and advanced versions. In our comparison, we used the more advanced modules when available. 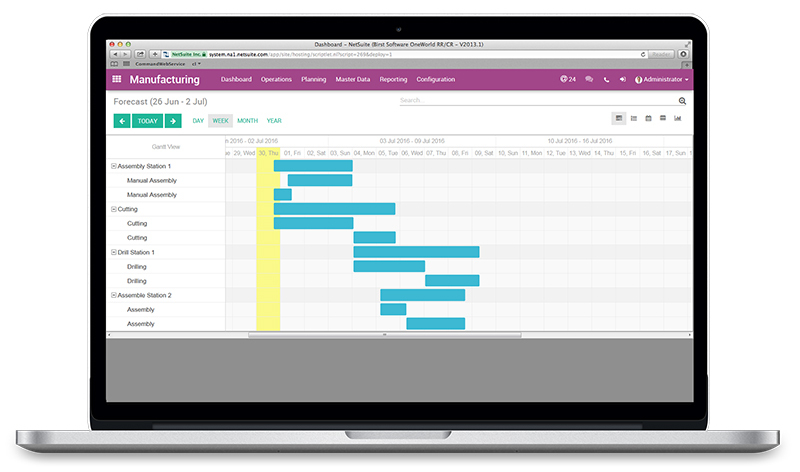 Odoo is an open-core suite of business apps. It is built on a modular structure in which each app covers one business function and each app is installed as needed. Odoo is available to be installed on-premises as well as in the cloud. 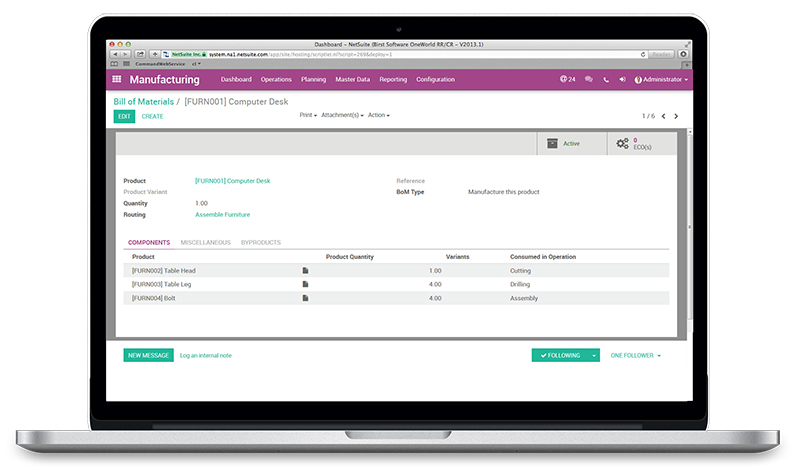 Odoo recently released a new version of its manufacturing app suite, adding quality, maintenance, PLM, and expanded mrp and mes functionality. In this document, we will compare the on-premises con guration of the latest release, version 10. 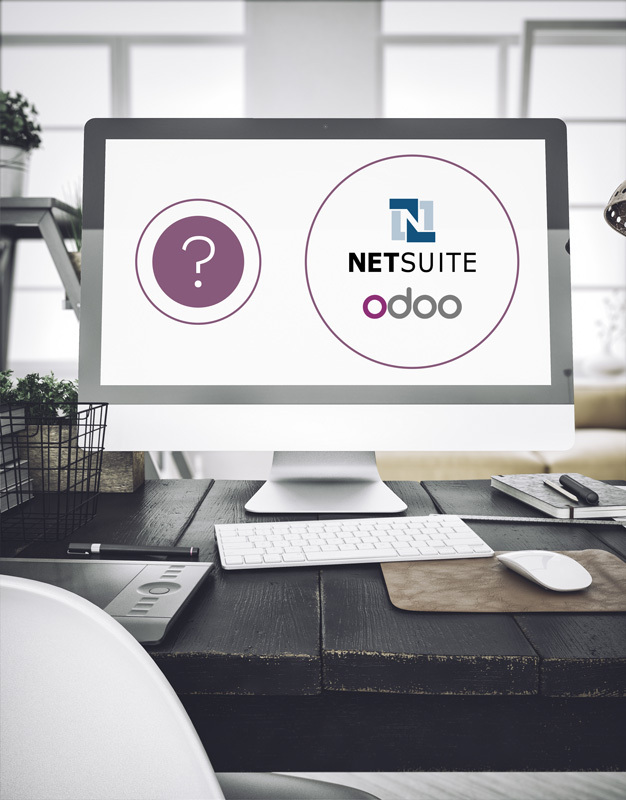 Support and implementation services for the on-premises edition are sold by Odoo certified partners, while support for the SaaS is provided by Odoo Inc. itself. The on-premises edition has thousands of community-developed modules which add or modify functions, allowing a high degree of exibility. The first-party SaaS only allows the installation of the three-dozen modules officially supported by Odoo Inc.
Usability, especially in enterprise software, is an often-overlooked but critically important aspect to consider during the purchasing process. Usability affects the efficiency of users working within the system, the ease with which the software can be implemented, and can reduce the costs associated with user errors. Additionally, users who spend most of their working day using the system will appreciate software that is easy to use. This is especially true for shop floor control systems, as workers there may be in a loud environment, moving quickly, wearing PPE, or otherwise not optimally situated to use a traditional computer interface with a keyboard and mouse. The special design considerations of a shop space or production line must be taken into consideration for any interface used there. We have selected screenshots of analogous menus within each software to demonstrate the visual elements and interface options for each software in this comparison. While it is difficult to assess software usability with a static image, a rough comparison can be made. The additional information can only aid your analysis. Many factors must be considered when choosing a manufacturing software. The complexity of the production workflow, the degree to which demand fluctuates, the lead times of production and procurement, the size of the organization, the growth rate of the business, the stockkeeping needs, the complexity of the support operations in a plant. The list, as they say, goes on. You must make the decision based on your own superlative knowledge of your business while working closely with whichever vendor you choose.